$19 flights and you choose from 13 cities to fly from. 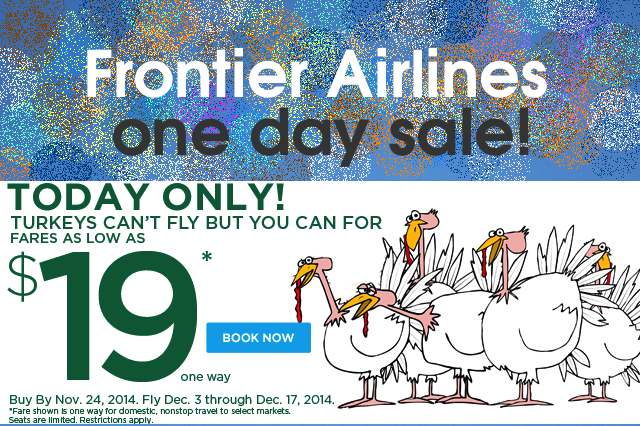 Frontier Airlines has announced an exciting one day sale. It beats everyone to the punch. This is hands down the best deal we have seen, period. The catch is it is one-day sale. This might be a new trend Frontier is bringing up as a Black Friday deal or it could last longer.. we don’t know, but this is a great bargain. Hands down. Note: we are not a Frontier representative or affiliate. This is being published for the benefit of our readers.